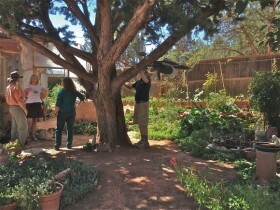 Greening Harmony is a grass roots neighborhood organization that started in the Harmony area of West Sedona in 2012. With the support of Gardens for Humanity and funding through the Sedona Community Foundation and the Verde Valley Medical Center we’ve been actively working together to build community through building gardens. Our broad commitment is to share and teach about gardening, wellness and the value of respect for earth’s limited resources. We accomplish this through demonstrating, teaching and assisting residents to grow nutritious food, to build rich healthy soil, and to adopt conservation strategies such as permaculture, slowing water, and rainwater harvesting. We are thereby working together to promote a healthy community and a healthy environment. This project is a model for building a gardening community that develops friendly relationships while producing fresh and delicious vegetables and beautiful gardens; where neighbors share resources and information that enhance their quality of life and provide opportunities for working together. After school teen internship program at Red Rock High School called Greening Seeds teaching sustainable gardening, job skills and providing opportunities for paid jobs helping residents with their gardens. Adult Mentorship program available to any resident wishing to deepen their knowledge of gardening by working along side of one of our Greening Harmony mentor gardeners. You can sign up for four sessions, one a week, for a month, or six sessions, one a month, for six months. GH gardeners will provide individual gardening mentorship, backyard garden consultations and guidance. Click here to donate and become a sponsor of Greening Harmony! Help us expand our Gardening and Wellness services, Adult Mentorship and Teen Internships to the broader community. This entry was posted on Thursday, August 28th, 2014 at 3:17 am. It is filed under COMMUNITY GARDENS PROGRAM, Greening Harmony, HOME GARDENS + WELLNESS PROGRAM. You can follow any responses to this entry through the RSS 2.0 feed.